Not many people have heard of Swiss carnival or what is locally known as Fasnacht. Personally, I was only familiar with the Mardi Gras in Rio de Janeiro, a festival parade with extravagant floats and beautiful women who are covered in flamboyant colors and feathers, showing off their scantily clad, perfectly shaped bodies. It was hard to imagine the diplomatic Swiss engaging in this same behavior, celebrating carnival in wintry temperatures. My husband grew up going to Fasnacht in Luzern every year, so I received my briefing on Fasnacht etiquette quite matter-of-factly. There are floats, there is dancing and waving, but there are definitely less feathers and bikinis. 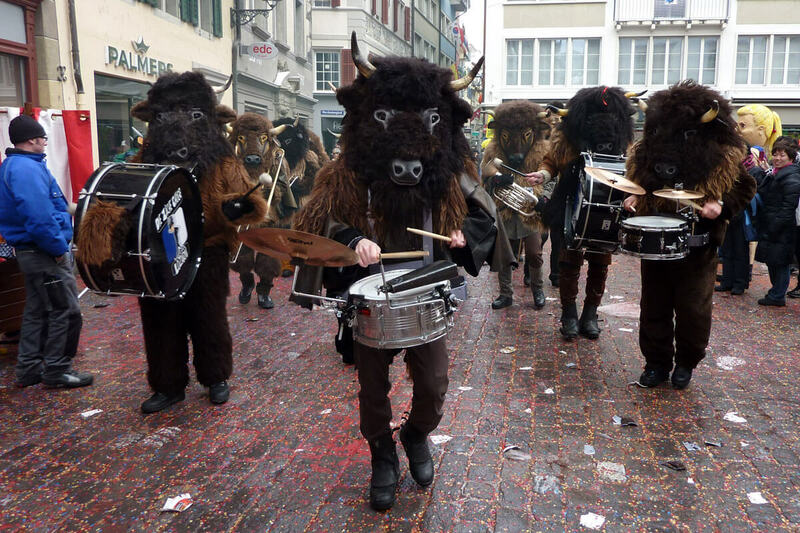 Here is a short primer on Luzerner Fasnacht. Officially a Christian celebration dating back centuries, Fasnacht derives its name from "das Fasten", meaning "the fasting period" or "Lent". Traditionally, a week before Ash Wednesday or at the beginning of Lent, many Swiss cities celebrate Fasnacht as a "last chance" to eat and be merry before the fasting weeks that follow. It is less about flaunting your looks, and more about flaunting your creativity. So, many come masked in their own creations. Where to go for Fasnacht? Of course, this is up for debate. If you are Swiss, you usually celebrate in your own town (granted that your town celebrates it). Some may even swear off celebrating in other regions other than their own. But there are two very popular carnivals in Switzerland held in the cities of Luzern and Basel, each attracting some 15'000 to 20'000 daily visitors during the festivities. Luzern, being a catholic canton, observes Fasnacht celebrations according to the liturgical calendar. It always takes place from Thursday to Tuesday before Ash Wednesday. Basel, on the other hand, celebrates a week after Ash Wednesday. It is widely believed that this difference in celebration dates back to the protestant reformation of Switzerland in the 16th century, when Basel, among a handful of other cantons, became protestant. Local newspapers constantly debate on who has the best Fasnacht. In my experience, both have their own unique traditions and styles that I can happily appreciate. My husband, like the rest of Luzerners, would swear that the Luzerner Fasnacht is better: It's less formal, less military, and more fun than the Basler Fasnacht. Who goes to Luzerner Fasnacht? Everyone is welcome at Fasnacht! In recent years, it has become a kind of tourist attraction. For a time, this alarmed local Fasnacht groups which were fearing that the essence of Fasnacht would be lost to mass tourism. But visitors to Luzern have also learned that it is almost a crime to come without a costume. Any idea is welcome, as long as it is not formal clothes. There is a saying: "Only tourists don't dress up for Fasnacht." So if you do not have a costume, you might as well stay at home and watch the official parade on TV. Unlike at Basler Fasnacht, there is no real difference between performers and spectators. Families and small groups of friends can just show up with their costume creations and walk the streets to be observed - and to observe others. So... What exactly happens during Fasnacht? It is hard to explain. For many, this is the time of the year when they can refer to anyone in the street with the informal salutation of "du" instead of "Sie". There is a general air of parody and horseplay, especially when everyone is dressed as something or someone else. Being in character and owning the role is somewhat expected. In short: During the week-long Fasnacht, people can let their guard down and engage in as much nonsense as they need! The opening of Fasnacht celebrations start on Thursday morning at 5 AM with Tagwach. This day is referred to Schmudo, or Schmutzige Donnerstag as in "Dirty Thursday". The term is derived from the word Schmutz, which in Swiss German connotes fat. The origins refer to the fatty sausages that farmers stored for the winter months. These sausages, along with many other traditional Fasnacht pastries (Zigerkrapfen, Schenkeli and Fasnachtschüechli), are served during this time to symbolize the need for calorie-rich meals before the 40 days of fasting that would follow. At 5 AM in Luzern's center, masked citizens gather in anticipation of the big bang to commence Fasnacht. As its name connotes, Tagwach is really like a military wake up call, with a sudden bang and confetti bombs exploding in the air. The masked brass and percussion marching bands - or Güügenmusik (pronounced gooken-moo-zeek) - start to play and walk through the crowded old town with onlookers following, standing aside, or dancing to the beating of the drums. In the afternoon of Thursday, the official parade takes place on the main road of the city. The bands will play, followed by their official floats, along with numerous other groups - sometimes official, sometimes rogue. The Güügenmusik usually play numerous renditions of current pop songs of the season or the past year, deviating less from the usual military marches of traditional marching bands. The float creations are also reflective of pop culture, ranging from popular movie series, famous characters, or even current political issues. What's on during the weekend? After the official opening, the old town will be in a continuous state of chaos until early hours of Friday. Then, things quiet down, though street bars and tents are still open to welcome the tourists who missed the Thursday opening. Saturday can also see filled streets, but less Güügenmusik, as many of the groups return to their suburbs attending local parties or performing for their sponsors. Sundays are usually reserved for Fasnacht celebrations in the more smaller towns outside of the city. Our town, for example, always holds it Fasnacht parade on Sunday afternoon, and the town's local Güügenmusik along with the neighboring towns also partake in the parade. Monday at 6 AM, there is another official Tagwach opening - a kind of continuation after the weekend of rest. And similar to Thursday, with an official parade once again in the afternoon, the chaos continues throughout the day, rain or shine, until the early hours of the following day. Tuesday, the last day of Fasnacht, is known as Kinderfasnacht. Families dressed in their own costumes are welcome as they get to show off their creations. Since only five Güügenmusik groups accompany the many families that take part in the afternoon parade, the parade tours through the streets of the old town. The parade stays on the small cobblestone alleys, giving the event a cozier and more personal feel. This is naturally our favorite day, as it is a delight to come as a family and see other families with their costumes. Later that day at 7:30 PM, the last parade takes place on the main bridge road by the lake. This official closing celebration hosts about eighty (!) Güügenmusik groups. They march and play one after the other, giving their last performance of the year's Fasnacht. And at around 10 PM, the crowds start to trickle away and people make their way home, content with all the eating and dancing and celebrations of the past week. Last year, we went to Fasnacht as a the "Cardboard Knights": Baby King cozy in the cardboard castle, Boy Kingsguard sporting black and red feathers on his cardboard helmet, ready with his cardboard sword, and the Hedgeknights, armed with their cardboard axes.